Removable drive combines the speed of a hard disk with the portability of optical media for quick, easy, affordable backups. 114X RD1000: Rack able Solution, configurable with up to two RD1000 drives bases and upgradeable up to 4 drives using drive upgrade kit, USB. The USB cables come in two different lengths of 2M (white cable) and 4M (black cable).Includes Symantec Backup Exec Quickstart for easily scheduled backups. The benefits of using a high-capacity, removable disk drive and accompanying cartridge like the Dell PowerVault RD1000 are evident when compared to alternative backup media. 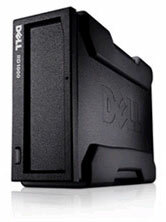 Rugged, removable disk media offers increased portability and durability over standard USB-based hard drive storage. The PowerVault RD1000 cartridges are built to withstand a fall from nearly one meter so they are very durable, plus the removable disk cartridges are small and lightweight and can be stored offsite for better disaster recovery protection. The PowerVault RD1000 provides easy expandability, when you reach capacity with one removable disk cartridge, just insert in a new one. There's no need to buy additional hardware. Plus the PowerVault RD1000 includes Symantec Backup Exec Quickstart software that provides data protection for faster data restores and reduced downtime. The PowerVault RD1000 features a protective disk drive cartridge that is available in 320GB , 500GB , 750GB and 1TB capacities. The RD removable disk cartridges are all interchangeable and preformatted. Archiving a collection of PowerVault RD1000 disk cartridges takes considerably less room than a similar amount of DVDs or CDs - it would take 36 standard DVDs to hold the volume of a single 320GB removable disk cartridge - all while saving shelf space. Symantec Backup Exec Quickstart included with the PowerVault RD1000 provides easy-to-use, backup and disaster recovery capabilities to protect files, as well as all user data to help provide faster restores and reduced downtime. *Price references as of March 5th, 2007. Acquisition Cost for an equivalent 80G solution. The PowerVault RD1000 provides Symantec Backup Exec Quickstart software for a complete backup of all of your system data. This easy-to-use software includes backup protection for Windows user and bare metal disaster recovery on all compatible Dell PowerEdge server and Dell Workstations. The PowerVault RD1000 removable disk cartridge contains a SATA II hard drive, the same technology that Dell uses across the PowerVaultTM disk storage line, the PowerEdgeTM server line, and the Dell PrecisionTM Workstations external drive. SATA II hard drive technology is a reliable, industry-standard for storage, and an ideal long-term and durable media. Files transfer to the PowerVault RD1000 at about the same time it would take to save to your regular PC drive, up to 30MB/sec - much faster than backing up to standard tape, and without the hassle of swapping out media due to capacity constraints. RD1000 320GB , 500GB , 750GB and 1TB cartridges have been qualified to withstand a drop of 1M to a tile over concrete floor. In most cases the RD1000 cartridges can withstand drops of up to 1.5M. The PowerVault RD1000 functions lying flat or on its edge, and its compact profile takes up very little space on a desk, or close to your server, allowing a backup solution that doesn't require rethinking your office arrangement. The removable disk cartridge is designed for durability, and easily fits into a briefcase, backpack, or even a coat pocket. The PowerVault RD1000's simple plug-and-play USB connection allows you to backup more than one system, or move it from home to office as you need. Each removable disk drive cartridge weighs about as much as a cell phone, and is only slightly larger.